Blue is one of the most popular colors in the world. It is peaceful and tranquil and can increase productivity in those around it. Our binding combs come in a wide range of sizes from 3/16 of an inch to 2 inches; these binding combs can fit any sized project up to 425 pages. The 19 ring design of these combs fits any standard comb binding machine and 8.5 x 11 inch paper. Plastic combs are designed to lay flat in both an open and closed position, making it so much easier to take notes or read and allows for getting correct margins for photocopying. 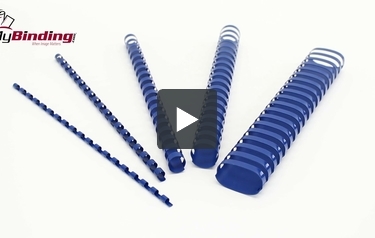 This royal blue plastic comb won't scratch, chip, peel, or discolor; it will be looking great for long time. Classic GBC Blue plastic binding combs.